Journalist and Rajya Sabha member Swapan Dasgupta on Friday said Assam has given a lot to be a part of India and now India should equally give back to this land. He was delivering a lecture on ‘Assam’s Problem, India’s Problem’ organised by Harendranath Barua Memorial Trust in memory of eminent journalist Harendranath Barua at Vivekananda Kendra in Guwahati. Dasgupta also stated that Assam has a burden of 40 per cent out of approximate 10 million illegal migrants in the country. “Government has failed to protect the borders (marking, fencing and policing of the border) with Bangladesh. This has made Assam victim. Assam has already been bearing the brunt of illegal migrants till 1971 and this is the reason why all section of people agitated,” Dasgupta said. Dasgupta also questioned the government’s stand in NRC post publication period. Dasgupta thanked Bodoland People’s Front leader Biswajit Daimary for his initiative in the parliament on NRC. “Daimary from Assam dared to talk on NRC in the parliament,” Dasgupta said. Manging director of the Assam Tribune group Prafulla Govinda Baruah and owner of Sadin Pratidin group Jayanta Baruah were felicitated on the occasion of Harendranath Barua memorial programme. 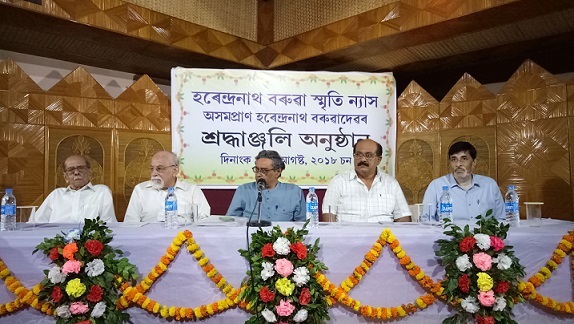 Eminent journalist and former president of Editors’ Guild of India Dhirendra Nath Bezbaruah, Asom Gana Parishad leader and former Assam Chief Minister Prafulla Kumar Mahanta, state BJP spokesperson Rupam Goswami, Media Advisor to Assam Chief Minister Hrishikesh Goswami along with other dignitaries were present in the programme. Two books – Ideas and Impressions by Rajib Prakash Baruah and Reflection of Assam edited by Jogesh Das (Reprint) were released on the occasion.